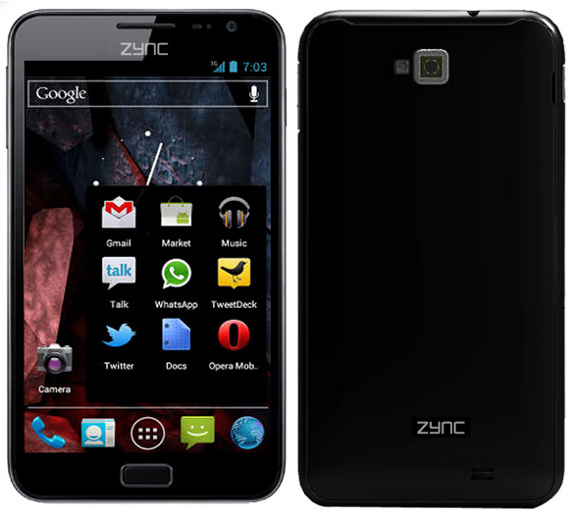 Zync has entered into the smartphone segment with the Zync Cloud Z5 Dual SIM Android Smartphone / Phablet. It has a 5-inch (800 x 480 Pixels) Capacitive Touch Screen and is powered by a 1GHz processor. It runs on Android 4.0 (Ice Cream Sandwich). This would compete with the other budget 5-inch Dual SIM Smartphones such as iBall Andi 5c and the latest Micromax A110. The company launched the Z-900 their first 7-inch tablet running Android 4.0 back in March, and has launched several tablets since then. It comes pre-loaded with Office Suite, Aldiko e-Book Reader, Bollywood Hungama, Daily Horoscope, ibibo Games, BigFlix and Zomato apps. The Zync Z5 is priced at Rs. 9490 and is available from Snapdeal. It also comes with 4GB of memory card in the box.